Independant reviews of Real Ale and Pubs at home and away. Paphos, Mandria and Nicosia. More Beer and Fun In The Sun. As you are probably aware by my previous postings on this blog, (HERE) and (also HERE) over the past few years Jane and I have been extremely fortuitous to have been able to spend a little time each summer visiting friends of ours, Geordie and Lynne, on the beautiful island of Cyprus. Last year, back in June, we would be joined by Doug and Sharon, 2 more of our hosts' friends, also from North East Lincolnshire. For the first time we would be flying from London Stansted airport, a departure point I last visited during the early part of my taxi driving days in the 1990's. Then, as I recall, it boasted a sizeable and modern terminal building but lacked the air routes and passenger footfall it has now. In fact, on my previous visit, I arrived, parked outside the main entrance to the terminal, as you could then, and was amazed that I was almost the only cabbie dropping a fare off there. How times have changed. It now has around 25 million passengers a year using the facilities with queues seemingly everywhere. This is accompanied by the constant rumble of aircraft noise, as they are either taking off or landing. After we arrived, and dropped the car off at the Meet and Greet, we made our way into the terminal and, after eventually clearing security, we decided on a drink and a bite to eat. Among the adequate number of restaurants, cafe bars and eateries is The Windmill, a Wetherspoon's outlet which, although not as cheap as its High Street cousins, did have a reasonable selection of cask and craft beers and a good selection of food on the menu.We ordered a pizza and, during our wait to be called to the gate, sampled three of the beers on offer. Starting off with the solid tasting fruit and citrus Golden Ale from Hanlons Brewery , the 4.2% Yellow Hammer, before a bottle of Redemption Brewing's Big Chief IPA, 5.5%, a good hoppy beer, with just a hint of honeyed sweetness. These were swiftly followed by a malty, slightly fruity bottle of East London Brewing Co. Cowcatcher APA, 4.8%. After these it was time to make our way to the gate, board our already slightly late Jet2 Boeing 737 aircraft, taxi out and wait.....wait for another 50 minutes. Apparently we, as many others, had become victims of an industrial action within France's Air Traffic Control. We arrived at Paphos Airport around 10-30pm, remarkably just after it had stopped raining, the last bit of precipitation we would experience for the duration of our trip, and we were soon being chauffeured by our hosts back to Mandria. Tonight would be a quiet night, just a few local Cypriot favourite Keo or Leon beers to wind down, catch up on the gossip and enjoy the company. Over the next few days we would be out for meals, both in Mandria and Paphos, but the choice of drinks were usually Keo or Leon. There were exceptions, but one must dig around, or do some prior research, to find Real Ales or Craft Ales. Luckily by now I did have that little bit of prior knowledge of the area, and I don't mind the usual Cypriot lager beers on a hot day either. So here is a potted review of what we managed to find on our most current expedition. Tomb of the King's Road. One bar we had visited on previous trips is The Wooden Pub. Situated overlooking Paphos Harbour and Municipal Baths, it is in a good area to start, finish or base yourself for a few drinks when you are in the resort. It is one of a couple of the local Aphrodite's Rock Brewery pubs in the resort. 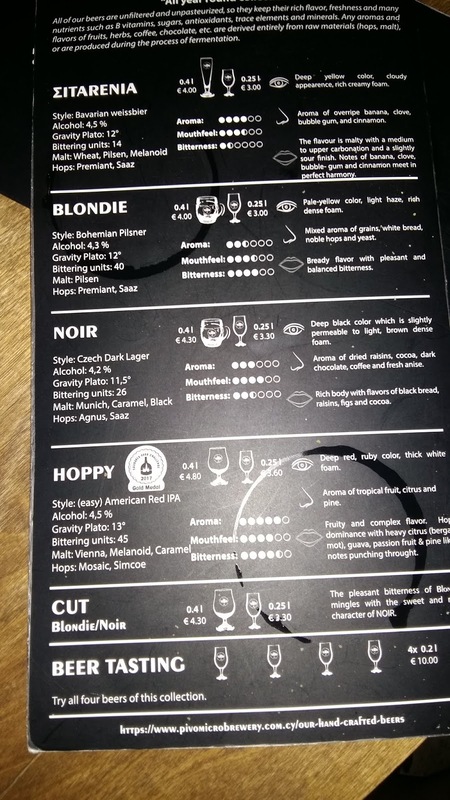 The selection is quite good, with some cask from Aphrodite's Rock and local beers in bottles from True Ale and Hop Thirsty Friends, nestled with the Greek based Septem brews, alongside which are some British beers, such as Brewdog and St Austell. The vibe is easy going, and if you just want to chill and watch the world go by,it is the perfect place. For the slightly more athletic, there are the options of board games available to help you exercise your brain, if nothing else. Just a 15 to 20 minute stroll away from here is Wooden Pub 2, on The Tomb of the Kings Road. Offering a bigger site, which includes a quite sizeable outdoor beer garden, this a good place to chill out too. I believe it does offer a bit of entertainment, local bands and singers, during some evenings. The beer selection is much the same as its sister pub and the staff are very friendly, taking the time to have some interaction with the punters. During my visits to the two Wooden Pubs I managed to sample the couple of beers on offer from Hop Thirsty Friends. First up was Humor Weiss, 5%. This Wittbier is mildly fruity, some banana notes are evident, before a viscous, fruity finish. The second brew, brewed, incidently, for Hop Thirsty Friends by Greek based Septem Microbrewery, was Humor IPA, 6.5%. Quite a solid, if typical IPA, to be fair. There is a reasonable bitterness, balanced well with citrus fruitiness, and a long dry finish. A good beer to quench your thirst on. I also had chance to re-sample some of the disappointing True Ales I tried last year and some new ones. I started with the spicy Vienna Ale, followed with the reasonably fruity Porter and finished on the quite grainy Blonde Ale, all 5%, which is an improvement in ABV's on the previous offerings. I also bagged a True Ale Ginger Ale, coming in at the same strength, which was quite malty, with yeasty esters at the opening, before the subtle ginger heat kicks in. I would say that they are not quite there with these brews just yet, but there has been a huge improvement in the last year and they are not too far away from producing a decent selection of beers. 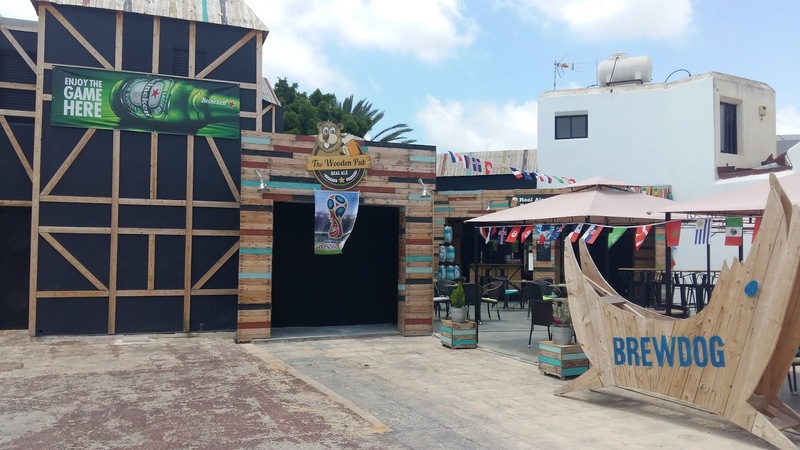 There are, of course, quite a few bars and restaurants in and around these two areas of Paphos, but most other places usually offer just Keo, Leon and Heineken. It is worth just asking, or looking at the beer fridge behind the bar though. Some do carry Aphrodite's Rock in bottles, and I did notice Wadworth's 6X on tap (keg I would guess) in a couple of establishments. Although I didn't get to visit this time, both the Old Fishing Shack Ale and Cider House in the resort, and The Beer Seller beer shop, just outside in the Geroskipou area, are going strong under the stewardship of Athos. There are a few bottled beers, some from the UK and Belgium, appearing in the supermarkets too. On our last visit we found the major rebuilding works were still ongoing in the Old Town area. Roads were dug up, pavements non-existent and, to be honest, a right mess. I can, happily, report that almost all the work is finished. 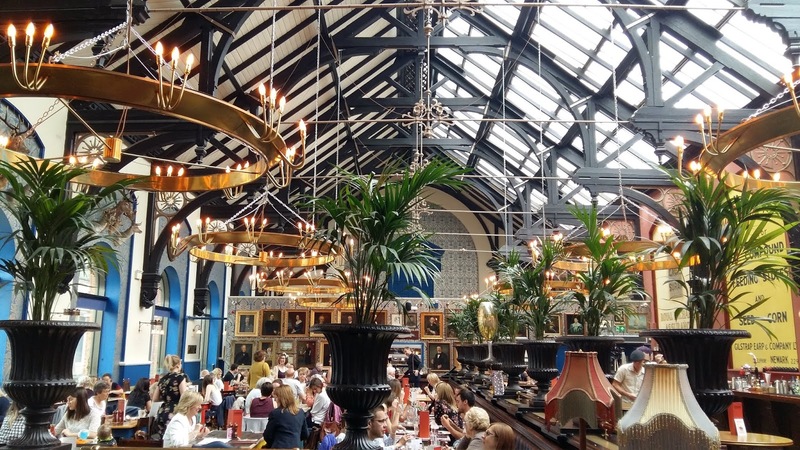 It has made it a bright and airy place to walk around, steeped in history but with a modern facade, although I haven't had chance yet to sniff out any real ales or craft beers in the bars. You will find Mandria just a short drive south of Paphos Airport and, although quite modern, it does have a certain type of old village charm to it. It is a growing area with a mixture of resident ex-pats, holiday home renters and owners, International tourists and, of course, local Cypriots. Raves and night-clubbing it isn't, but more than half a dozen cafe bars and restaurants adorn the village centre, each with its own character. 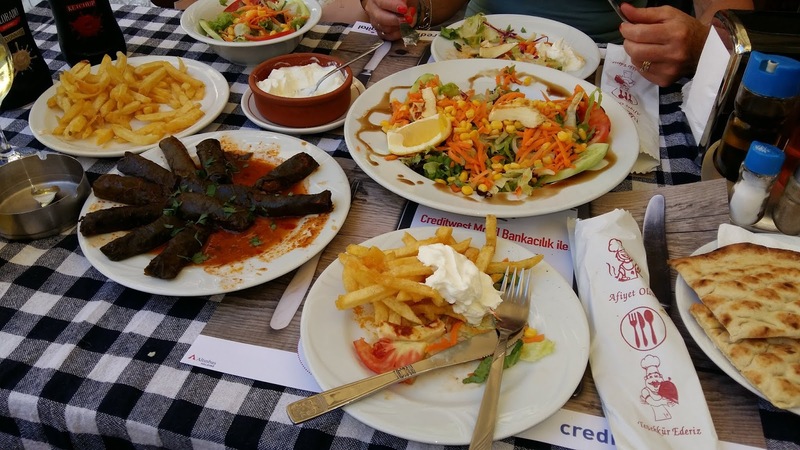 The food choices are more than ample, Italian, Fish and Chips, traditional Cypriot dishes, and take-away options are all catered for. There seems to be a local competition as to whom can supply the biggest pork chop or the most spare ribs so the meals in the village are very good value for money, whoever you choose.The six of us enjoyed quite a few "competitive" meals here. As for beer, two neighbouring bars deserve a mention. Klimataria offers all the usual suspects but, if you ask, you will find bottles of 8.5% Duvel Belgian Strong Beer on offer from the fridge here. They are quite reasonably priced too, and, lets face it, this beer, with its grassy and floral notes, spice at the back leading to a long citrus finish, rarely disappoints. Directly over the road is Kentrpoikon. You can find two of the Erdinger Weissbrau beers, Weissbier Hefe-Weizen and Erdinger Weissbier Dunkel, on tap here. Both are 5.3% and as”standard” as you would find anywhere. On our first ever visit to Cyprus, back in 2005, we stayed in the Protaras area. One of our many highlights from that trip was a visit to the only divided capital city in the world, Nicosia. It was quite fascinating and crossing the fortifications of the “Green Line”, (UN buffer Zone) showed more than the physical divide between the Greek influenced Republic of Cyprus and The Turkish Republic of Northern Cyprus. Back then, a visa to cross over the border cost £1 CYP and restrictions over goods were very strict. Now it's more relaxed and it has more border crossing points, making it somewhat easier, although tensions still exist. But this isn't a history lesson, nor a political analysis. I will leave that to those who are more qualified. On our trip, after taking the bus from Paphos to Nicosia, we stayed just a couple of blocks away from the crossing point in Ledras Street. We cooled down with a couple of Keo's (of course) on our arrival at the nearest street cafe-bar before crossing over to the TRNC for a bite to eat. Now, if you want real ales or craft ales in the north you will struggle. On our trip over, I did have a couple of “possible” bars on my list. Unfortunately, with it being late afternoon, a few bars were not open which curtailed our beer search, so food (which was very cheap, plentiful and absolutely wonderful) and Efes were our rewards. Our next trip here might uncover those elusive brews I have been searching for. Afterwards we wandered around a little while before crossing through the checkpoint and proceeding back over the border. We'd had a rather pleasant afternoon, one we hope to do again. 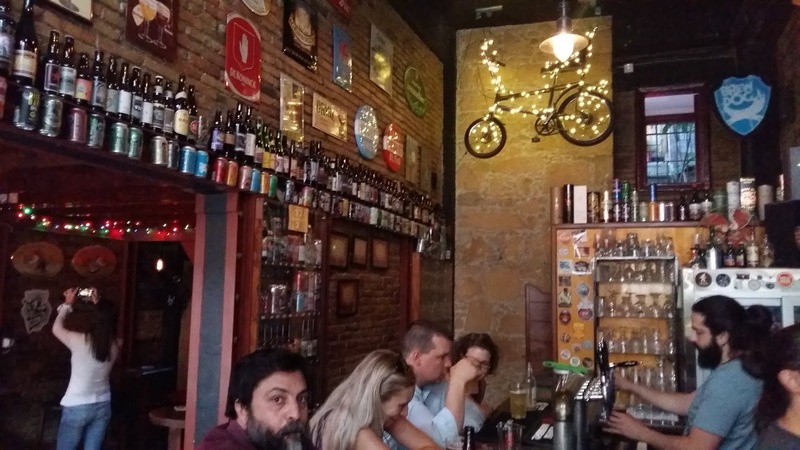 Our next stop was Brewfellas, a friendly craft ale bar, just off Ledras Street. It has a pretty good range of beers on tap, as well as a great selection of botles and canned craft beer. Also there is a beer shop adjacent. We had planned to go out later that evening, so we just had time for a quick drink before heading back to our digs. My choice was Tempest Brewing's Elemental Porter, 5.1%, a nice bitter-sweet brew with coffee and Dark Chocolate, whilst Jane had the Budweisser Budvar Czech Pilsner, 5%. Both were very well kept. After freshening up back at our digs, we strolled out to a microbrewery and taphouse not too far away from were we were staying. This was Pivo Microbrewery, nestled close to the city's divide. This is a bright and airy bar, and has a mixed customer base of tourists and locals, but the love of beer is the the draw, along with knowledgeable staff and what looked like excellent food (although we didn't eat here ourselves after our huge plate fulls of grub we received over the border!). There are quite a few in-house brewed beers on tap and in bottles, and the range should suit most beer seekers. We started off with the 4x 0.2l Beer Tasting selection. This consisted of Pivo's Sitarenia Bavarian Weissbier, a malt driven brew with subtle stone fruit and bubble-gum at the back, 4.5%, Blondie, a 4.3% nicely balanced Bohemian Pilsner, a Czech Dark Lager, 4.2% Noir which imparted a nice mix of dark fruits tempered by light chocolate onto the palate and Hoppy, a quite complex American Pale Ale of 4.5% its fruit, floral notes and a tingle of citrus at the back which forces through to dominate in the finish. After sharing our four beers, Jane carried on with another Blondie whilst I went for the last 2 beers on tap. Smoked Fish, an American Smoked Ale of 4.9%, certainly has plenty of smoke in the taste with sweet fruit and just slight strains of citrus adding to a quite heavy mouthfeel, whereas Hopfish is totally opposite. This Summer Ale is light, hoppy and has a good citrus buzz to it. A very refreshing beer of 4.1%. It was now time to move on, so we headed back to Brewfellas, which, by now, was quite busy. A G&T was Jane's order, which was poured with a very generous spirit measure. I decided to go for a half of Tempest Marmalade on Rye, a big robust tasting DIPA of 9%, where sweet fruitiness is balanced its citrus and a lovely back bitterness. Last up was another half, this time Northern Monk/Against The Grain Collaboration Peanut Butter & Jelly Brown Ale, 10%. Wow! What a big punchy flavour. Jammy,malted caramel and biscuity sweetness on the outset, then the nuttiness of the peanut butter, and more fruit combine to lift the sweetly dry, but balanced, big finish. The high alcohol strength is not noticeable in the least. A surprisingly easy to drink beer, especially with that high ABV. We had really enjoyed our night out in Nicosia and the following day, as we sat outside another friendly and quaint cafe-bar, sampling more generous food servings and local hospitality, we had already made our minds up to return here on our next break in Cyprus. Another highlight of our visit was Sunday dinner, Cypriot style, taken at a traditional Taverna up in the hills beyond the Asprokremmos Reservoir, overlooking Paphos. There is no menu, or set meal, you book in and sit back and, over a cool beer, wait. Then it arrives, almost meze style. You are not quite sure what will come next, but you will get fresh bread with mixed starters, plenty of vegetables and huge roasted potatoes, piles of whatever meats are being cooked, and followed up with a dessert. Last, but not least, the zivania spirit comes out! Marvellous, and good value for money too. Our 8 days in Sunny Cyprus seemed to be over so quickly. As we reflected at the airport, awaiting our flight back to Manchester, it was clear that we would returning soon as this is still one of our favourite places to visit. 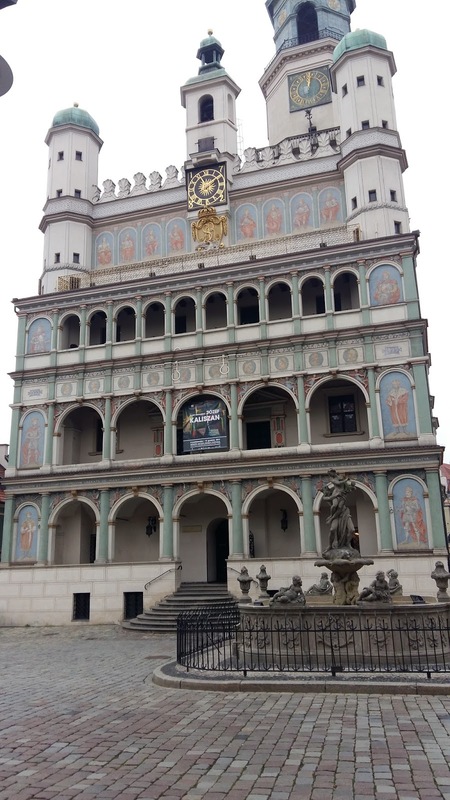 Here we are, entering the second quarter of October 2018 and I still have not blogged about anything that has happened since our trip to Poznan last November!. How rude of me. This is partly due to my work and free time balance, as well as a gradual change in my drinking habits. With the allotment, grandchildren and jobs around the house taking some precedents, my habits have been slowly going from “Big Nights Out” to drinking in leisure at home, enjoying the garden and sampling beers delivered from beer suppliers Flavourly, Beer52 and Honest Brew, along with others sourced from the Cleethorpes beer shop, Message In A Bottle, as well as any additional beer shops we come across on our travels. I must admit that the supermarkets seemed to have upped their game too when it comes to supplies of better quality bottled and canned beers. The Beermonster does still manage a trip out to the pub, from time to time,mostly away from my hometown, and, because of that, there are tales to be told. I will now try to expand on these tastings just a little further. First of all, though, a little bit of better news from our local beer scene, namely North East Lincolnshire. The Craft and Real Ale offerings has, at last, started to improve slightly over here in Grimsby and Cleethorpes. 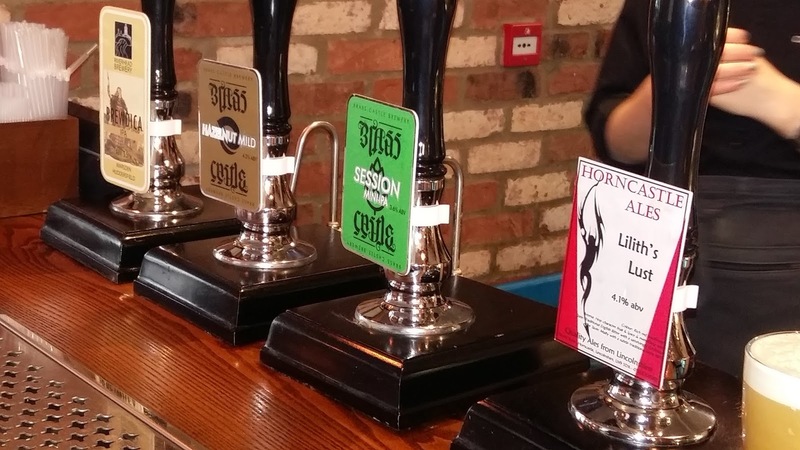 Axholme Brewery have managed to expand its availability of their cask and bottled ranges into more pubs in the area, especially their Cleethorpes Pale Ale Cask. They have also just put the finishing touches to a second brewery, this one in Grimsby, between the main shopping area and the town's dock, which will go by the name of Dock Beers.There is also a Tap Room bar on site. I can't wait for my first visit. Meanwhile, up in neighbouring Cleethorpes, The Counting House, and Arthur's House and a new and relocated Society Bar have all emerged to plump out the growing craft beer and cocktail offerings in the resort. We have visited The Counting House on a couple of occasions, which is housed in a former bank in Sea View Street. The range of beers, which isn't huge, usually contains one of the Axholme Brewery beers. There are plenty of cocktails on offer though. During a couple of our trips to Cleethorpes, we have also popped into The No 1 Rereshment Rooms on the station, which is not to be confused with the other excellent real ale bar situated on Cleethorpes Station, the No 2 Refreshment Room, or Under The Clock, as it is known. The No 1 has a good selection of cask ales, spread over two bars, and the clientele are very welcoming. Although the upholstery, on our last visit, certainly needed an upgrade, the memorabilia spread around this multi-roomed bar certainly adds to the character. We usually pop into The Bobbin whilst we are in the resort, and, on our last visit, we opted to go for each of their three new craft cans on offer from Cork's Franciscan Well Brewery (part of Molson Coors). First up was Friar Weisse Wheat Beer,4.7%, which had a fruit and clove aroma, which is followed by citrus, some yeast and soft spice. Next up was Chieftain Irish Pale Ale, 5.5%. This one has a solid malt backbone, with tropical fruit, hints of vanilla, some citrus along with a nice hoppy lift at the back. Last up, Rebel Red Ale, 4.3%. Plenty of caramel throughout, with some berry fruitiness coming through at the end. It is, at last, looking a slightly more promising beer scene in our neck of the woods. One only hopes that this continues. One of our days out earlier this year was to The Capital of The Lincolnshire Wolds, Louth. This visit was days after the last snows of a very long winter, and saw the last vestiges of the white stuff still draping over the the base of the hedgerows, and the River Lud angrily thundering through town, brown and moody looking. We have been to this market town many times before, and I have also reviewed most of the drinking establishments within it. 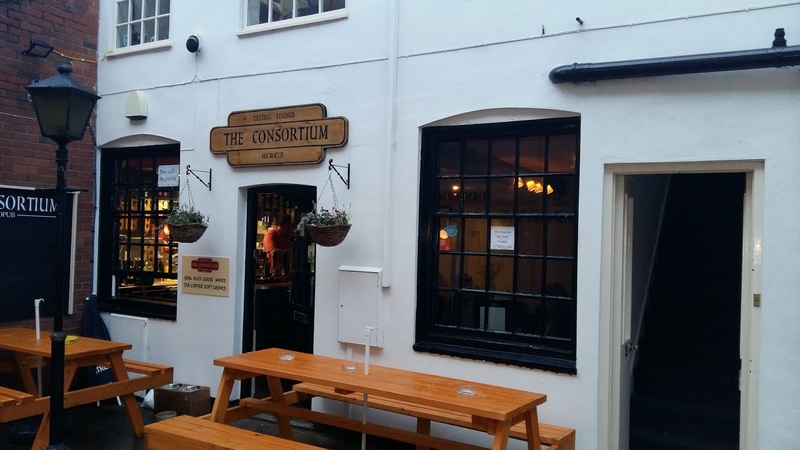 This time, after a meal in The Woolpack, followed by a couple of beers in The Gas Lamp Lounge, we wandered back into the centre of town to the recently opened microbrewery and micropub, The Consortium. This former coffee shop is the smallest bar in Louth, and probably one of the smallest in Lincolnshire. Although space is at a premium in here, the ambiance is friendly and the decor tasteful and fitting with the ethos of the place.It has a good half a dozen cask brews on offer, some of which are The Consortium's own. The beers we sampled in here were all from the house brewery. I started with a 3.9% Lincolnshire Porter, a nice plummy porter with just an edge of coffee at the back and a nice dry finish. Jane went for King Lud, 4.4%, a nicely crafted Pale Ale, with a citrus fruit over a balanced bitter-sweetness in the main which leads to a zesty bitterness at the back. Whilst Jane stuck with her choice, I went for Consortium Brewing Co's Street Beer Series IPA, 4.5%. Although not quite as punchy and hoppy as some IPA's, this was still a good refreshing brew. Red berries and some soft fruit combine well with zest and leads to a crisp finish. After our session here, we decided to visit a pub that has won many Real Ale awards over the years, The Brown Cow Freehouse, in Newmarket. Being short of time, the last bus was due to leave in 30 minutes, We quickly ordered our drinks, Fuller's London Pride, which we enjoyed in the packed surroundings of the bar before rushing back to the bus station. 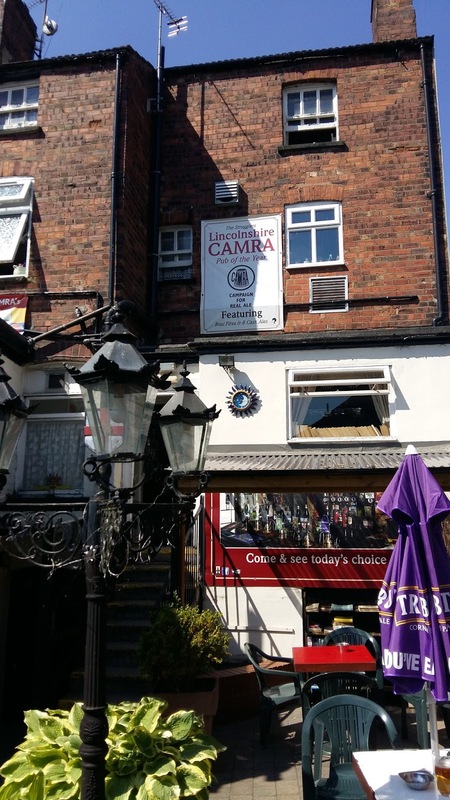 The beers all seemed to be in good order, the bar staff are friendly and, by the size of the portions on the plates, the food is well received by the many punters who frequent this freehouse. What a good day we had experienced yet again, and we often wonder why we don't nip on the bus there more often, although the 40 to 50 minute ride back on the bus with no toilet does suggest one reason! Jane and I (well, Jane really) decided on a bit of pre-holiday shopping, and, as we hadn't been there together for a while, we opted for a day out in Lincoln. Arriving by train, we wandered up towards the High Street area to do the retail therapy bit before heading to our first pub of the day. We decided to give The Cosy Club, housed in the recently renovated Corn Exchange building, a look. 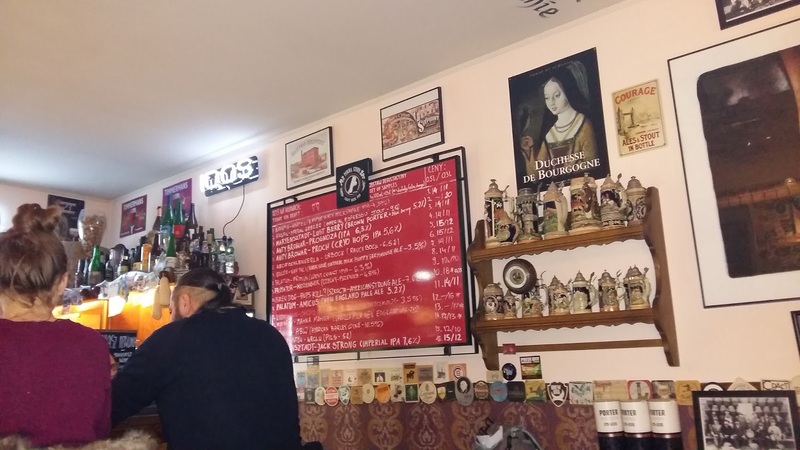 This is a wonderfully and sympathetically decorated bar with original marketplace advertising on the walls joined by paintings of the custodians of this former trading place. I would feel the need to grow and wax a fancy moustache if I were to be a regular here, such is the authenticity of the surrounds. On our visit the only cask ale on was The Lincolnshire Brewing Company's Cheeky Imp, a 4.6% nutty and malty Bitter with a nice bitter-sweetness throughout. Part of the profits go towards Lincoln City FC's Future Imps programme. Being a Grimsby Town fan that was a big sacrifice to make in the name of beer reviewing, but the beer did win. Next up, whilst my Good Lady visited another couple of shops, I was let off the reigns for an hour to do my own bit of exploring. My next port of call was The Dandy Lion Alehouse, in Newland. In here I chose a Lagunitas Day Time Ale,4.6%, a nice floral and citrus IPA style brew, with a wonderful lemon sherbert like tickle in the dry finish. The pub has a relaxing feel, and is quite modern in its interior design. After this it was back to the hustle and bustle of the centre, and another bottled beer in The Curiosity Shop, situated at the beginning of The Strait. Inside, the decor is best described as shabby chic, I suppose, but an amiable warmth is forthcoming from the bar staff. My beer of choice was Brooklyn East IPA, weighing in at 6.9%. I sat outside and savoured the bitter opening to this one, which is followed by a hint of treacle sweetness and some citrus zest. There are hints of dark fruit in the depths but citrus and zest are the main players. Nice. Now reunited with a happy shopper, we popped across the road to The Cardinal's Hat. I have previously reviewed this pub ( Here and also Here 2) so straight on to the beers. Jane had decided to keep to cider in the main today so that was an easy pick. I decided to go for the Beer Flight, four of the 1/3 pint measure sampler cask beers for £5.25. My selection was Pentrich Brewing Rain of Ruin, at 9% a lovely big and punchy Imperial Stout, 4.5% Factory Pale Ale from Manchester Brewing Co, and two from Dukeries Brewery. These were Lord Furnival Strong Golden Ale, 5.1%, and Castle Hill Best Bitter, 4.2%. All four on my flight were good solid beers and certainly well looked after. The food is good here too. We shared a platter of meats, which came with bread, olives etc. Fed and ready to go, we took a gulp of air before marching from here up The Strait and Steep Hill towards its summit, and our next bar, BeerHeadZ. Another first visit to this bar, and what a place! I counted 15 cask and craft keg pumps and a fridge full of more craft ales. We sampled three beers in here, First up was Fyne Ales Loch & Key, 5.5%, a nice brew with soft flavours of citrus, berries and just a touch of pine. This was followed by a Kinver Brewery Kinver Egdge, a nicely balanced nutty 4.2% Bitter, with soft hops at the back. Jane, meanwhile, deserting the apple juice, had the Wellbeck Abbey Brewery National Treasure, a Golden Ale of 5.4%. Although nothing exceptional, it was still a solid brew with a medium biscuity sweetness and dry and bitter finish. Our next stop, the final one at this altitude, was The Lincoln Tap House and Kitchen. There is a lovely roof terrace here, which gives a nice view over Bailgate and towards Lincoln Cathedral. The bar, downstairs, hosts 10 different pumps and from these we ordered a Beavertown Neck Oil, 4.3%, a light, crisp and refreshing Pale Ale and an Aspall's 5.5% Suffolk Dry Cider, before taking in the view. We, finished our drinks, bathed in sunshine but with an edge of coolness still in the air, and decided it was time to retrace our steps towards the bottom of Steep Hill, grab a final drink or two, before moving on to the train station. On the way down the hill, towards The Strait And Narrow pub, we popped into The Crafty Bottle Beer Shop, this was for MY retail therapy. After picking up a few little treats for home we settled ourselves in the large but cosy interior of The Strait And Narrow and ordered our drinks. This time it was Waen Brewery Lemon Drizzle, a 3.7% Golden Ale with, obviously, a cake and lemon tang to it, and a 4% Timmermans Peach Lambic. A sweet and fruity ending to our Lincoln visit, and, besides a slight bag malfunction which enforced a hurried game of "Chase the Bottle" down the lesser slope of this area of Lincoln, our enjoyable day out uneventfully came to a close. We boarded our train back to Grimsby in the knowledge that our next big day out would be in the warm Mediterranean sunshine of Paphos.....but that is another story. Cheers and Keep it "Real"
Doing the Poznan. Our trip to Poland. In November, The Wife and I had a few days booked off together and, after looking around for a cheap UK break with no success, we decided to see what was on offer a little further afield. We found that Eastern Europe was very affordable, with flights as cheap as £12-99 each, each-way from nearby Robin Hood Airport. Poland has long been a country that has intrigued me. It is situated at the northern crossroads of Europe, which has meant it has become pivotal in the expansion plans of many a neighbouring state. Skirmishes there have been plenty. The changing face of Northern Europe over the last 250 years ago has mostly seemed to include either the partitioning, annexing or redrawing of the nation's boundaries. That is not to say that Poland, or its people have just rolled over, no, far from it. Brave is a word often used in describing the Polish in the history books. This, though, is a beer blog, so I shall leave the rest to those more qualified. Our flight, with Wizz Air, which was late evening,checked-in, boarded and departed on time, We soon arrived in Poznan just after mid-night, got a taxi to our hotel, Hotel Vivaldi, and, being that we had enjoyed a few relaxing beers earlier in the day, before turning in, we settled for a mini-bar Lech for a nightcap, which was crisp, refreshing with a nice bitter uplift at the back. It is a basic lager, no frills, brewed in Poznan, albeit under the Japanese Asahi umbrella, and, well, not a lot more can be said. We would have almost five full days to explore the city, starting after a good nights sleep. Poznan is quite a well appointed city for things to do, with a myriad of museums, castles and the like for those with an interest in history, along with galleries, huge parks and at least a couple of big retail therapy centres, for those with other wallet draining pastimes on their minds. Most of the facilities can be easily reached by the local trams. The starting point for most visitors, and the Jewel in the Crown, is Stary Rynek (The Old Market Square) with the postcard perfect Town Hall and its picturesque former Merchants' Houses which envelop it. The Town Hall plays host to two mechanical butting goats, which are a big tourist magnet here, especially on the stroke of noon, as they emerge from the clock tower and perform their party piece. The surrounding buildings are a mixture of bars, restaurants, craft and souvenir shops, and gives this area a nice busy and bustling feel. From this central point, the streets spread out like a spiders web and it can be quite easy to find yourself if not lost, then certainly in a different place that you thought you were! Mind you, most of theses streets can offer more drinking and eating establishments to rest in and regain ones' bearings. With all this in mind, on a cold November morning, we walked into the city's old town, which took around 30 minutes, and a couple of directional adjustments, to experience what was on offer. After a good look around at the picture perfect surrounds, we entered our first bar of the trip. 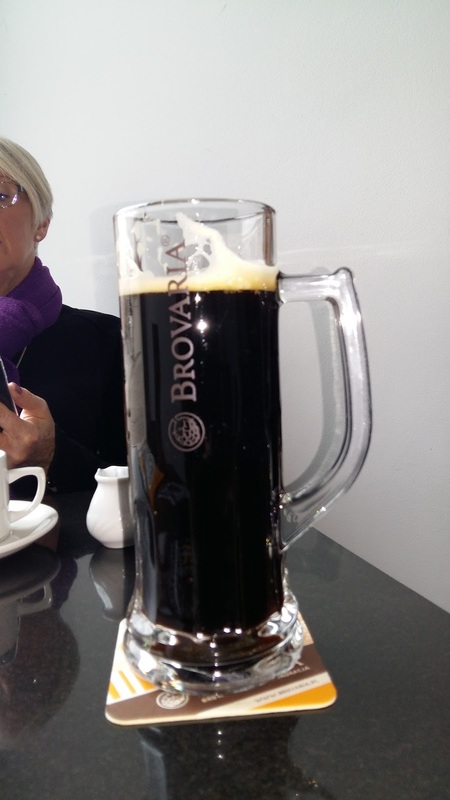 This was Brovaria, and after a very polite welcome from the bar staff, we were soon seated, looking out on the Stary Rynek, Jane, warming her hands on a coffee, whilst I sampled an excellent 9% Brovaria "Porter Balticki". This brew was full of roasted coffee and dark chocolate flavours with a good back taste of sweet dark fruits at the finish. I was really surprised at how easy this one slid down, it was incredibly easy drinking for a beer of this ABV. A quick check of the watch saw noon arriving, so we finished up our drinks in favour of what was on offer atop the Town Hall. After the duo Capra cranial entertainment, we relocated to our next bar. Pijlnia Wodki i Piwa, just away from the square in Wroclawska, gives the impression of an old 1960's style American Drive-in, but with a noted East European slant. Again, the welcome was genuinely warm. In here we sampled Zamkowy Brackie, 5.5%, a rather sweet and creamy pilsner with a reasonable back bite of bitterness, and the slightly malty and grassy Warka Classic, also 5.5%. Both beers were more than OK, and were setting us up nicely. Guliwers Bar, opposite the Town Hall was to be our next port of call. The beers in here all seemed to be Polish major brands, so we shared three of the Tyskie (Asahi) Ksiazece brews. Ksiazece "Czerwony Lager", 4.9% has slight caramel opening and then leads through to a slightly bitter-sweet and floral finish. Ksiazece "Chiemne Lagodne" is a 4.1% dark Lager, and the taste has a nice touch of bitterness throughout, balancing an IPA type backtaste of resinous hops, with yeast esters just coming through to balance it further. The final of this trio was Ksiazece "Zlote Pszencizne", a golden wheat beer offering, which was bright, slightly fruity and had a reasonable hoppy backtaste, 4.9%. To be honest, I have had better beers, but I would not hesitate giving them another go if lack of options dictated it. Feeling a bit peckish now, we headed to get some street food before having another drink. We decided to try zapiekanka, a sort of foot long Polish pizza. Very nice, with a topping of mushrooms, cheese and a chilli ketchup being my choice. Grazing done, we headed back to Brovaria and sampled Brovaria "Wheat", a beer full of little jabs of flavour, some fruit, then a hint of spice, a bit of citrus. The beer is quite complex but not overly so. Brovaria "Pils", is an acquired taste. Slightly astringent, some viscous traits and a mish-mash of fresh, but slightly conflicting citrus flavours. It isn't bad, but just sort of tries too much to please. Overall though, not a bad first day. Now the walk back to the hotel faced us. We headed this way, then with a surety we were going correctly, turned a corner, and another and.....Oh, this doesn't look right. A few more twists and turns later, punctuated only by finding an excellent Craft Beer shop and exchanging views on my map reading skills with the long suffering Jane, we finally, and luckily, arrived back at our hotel. We put some beers in the fridge, which I will review at the end, chilled out ourselves and then headed to the hotel's bar. Jane was on G & T's tonight, so I plumped for Kolobrzeska Fabryka Piwa "Colberg Black Lager" , 6%. A sweet malt opening, with plummy dark fruits at the back tantalise the tongue but do not overpower all else. The finish is long and pleasantly bitter-sweet before a waft of dryness satisfies the palate still further. I liked this one, in fact I liked this one a further couple of times! We started the day with a hearty buffet breakfast, a walk around the extremely interesting Park Cytadela, stopping off at the Muzeum Ubrojenia and the War Memorials, before buying a multi-trip ticket for the trams. Shortly after noon, yes, we would miss the goats today, we were on the tram going back to the centre. Today I would have to embrace shopping into my day. First stop though would be Green Line, a cafe bar with an impressive selection of local beers, situated in Stary Rynek. We chose Fortuna "Imbir" (ginger) stout 6.1%, and Miloslaw "Pilsner" 5.4% to start. Fortuna "Imbir" has a slight cola taste at the start, then a rich stem ginger flavour comes through. The finish is medium long. I like ginger so I quite liked this, others may not. Jane's Miloslaw "Pilsner" is not an average tasting lager, floral herb opening, then a bright light sweetness followed by subtle hoppy bitterness. Very nice. I followed "Imbir" with Fortuna "Miodwe Ciemne" (dark honey beer), 5.6%. Good strains of honey sweetness greet the taste buds from the off, some malt follows, but honey is in charge. I found it quite nice, even for such a sweet beer. Following these drinks we wandered off to do some shopping, or rather I was encouraged to show my Good Lady where the closest of the shopping centre was. To be fair, I wanted to see it too, as it was housed in a former brewery. Stary Browar, was the home of the former Hugger Brewery from the mid 19th Century until around 1945. After being left in ruins it was partially reconstructed and in 2003 eventually turned into a shopping centre. Inside this mammoth, almost cathedral like, building, over 200 stores and restaurants are sited. A good amount of the original architecture seems to have survived. We decided to have another quick drink, back near the centre, and then jump back on the tram to our hotel, for tonight we would be sampling the local cuisine. Our last drinks of the afternoon were enjoyed in Chmielnik, a bar just away from Stary Rynek. This extremely well stocked pub, it carries an excellent selection of Polish craft brews, is surprisingly large on the inside, considering its street-front facade. It also boasts a decent sized beer garden too. On our visit, just at opening time, it was very quiet, but we were advised that peak times here see the place rammed. Jane's choice in here was Miloslaw "Marcowe", a 6% Marzen styled beer,which was reasonably tasty, some malt and bready hints coming through before a balanced dry hop finish. I went for a Miloslaw "Black IPA z Yuzu", 5.6%. There is a good roast malt hit at the start of this one, then a deep citrus back taste comes through. There is a slight resinous feel on the palate which I believe must be the Asian Yuzu fruit strains coming to the fore. Interesting, and not bad at all. Later that evening we returned to the Old Town area for a quick drink in The Tropicana Bar, "Lech" and "Warka Classic", whilst our table at Wiejskie Jadlo Restaurant was readied. The meals in Wiejskie Jadlo are authentic, extremely appetizing and are not served in small portions. For starters we had Barszcz Zurek (soup in a bread bowl) and Bigos (hunters' stew) which were absolutely beautiful. We followed this with a mixed Polish meat platter to share. Oh my goodness! A huge pork cutlet and a steak each, plus a pork knuckle to share, along with all the trimmings, pickles AND Polish dumplings (pierogi) What a feast. We washed this banquet of food down with two local beers apiece. 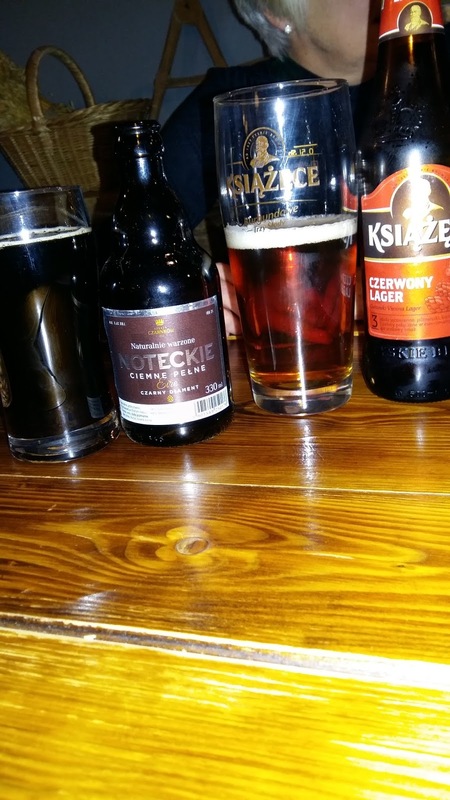 Jane chose the Ksiazece "Czerwony", which we had previously sampled, whilst I went for Browar Czarnkow "Noteckie Ciemne Pelne" 5.6%, a full flavoured brown ale which had lovely coffee taste, tempered with rich dark fruits. The finish was long with a good bitter dryness. We had agreed that today would see us(?) 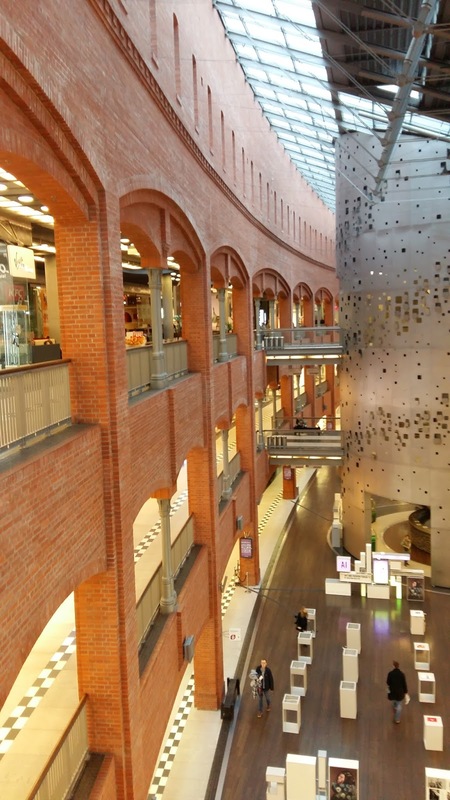 do some Christmas shopping at the big Posnania Shopping Centre, a 20 minute tram-ride away. With this in mind we left Hotel Vivaldi in torrential rain and eagerly waited for our tram. As usual, it arrived on time and we were on our way. In Posnania there are over 200 boutiques, 40 cafes and restaurants as well as many medium-sized stores. Whilst my beloved would be bargain hunting, I had my own agenda, a visit to Bierhalle. After our initial wander, we decamped to the Man Creche so the main event could begin. This is a bright and airy two-storey bar in a German style. The beers are unfiltered and unpasteurised. We started of with a 400 ml Bierhalle "Pils", 4.9%, whilst I indulged in a 1 Lt glass of 4.8% "Dunkel". The "Pils" was lightly bitter at the start, some grassiness with just a hint of spice at the back. The "Dunkel" had bready hints, some nuttiness all wrapped up in a nice sweet caramel body, ending with a nice spike of bitterness. Left to my own devices, I followed up with the smaller 400 ml Bierhalle "Weizen", 4.8%, which started out with a nice sweetness, before yeast esters and lovely soft fruit come in to play.There is more fruit at the back and some herbal aromatics. I really enjoyed this one.Next was Bierhalle "Pumpkin Ale", a nicely spiced ale, cinnamon, nutmeg and the heat of ginger were definitely evident, and complimented the maltiness and light floral hoppiness. 5.8%. Jane had now returned and was indulging in another "Pils". On paying neither of us could believe how little it all came to. All that beer for just a few pennies over £12-00. Cheap as chips. Shopping done, with a few Christmas pressies for the Grandchildrenin hand, we headed back to the tram stops. With the weather still bad, we decided to head straight back to the hotel and come out later for a bit of a night out. Early evening saw us heading back out towards the highly acclaimed Piwna Stopa bar, just away from the centre. With it still being relatively early, we were surprised at how busy it was. Along with a roaring log burner, and plenty of people, we were greeted by an array of local, national and world bottled beers as well as 16 beers on tap. This was taking Craft Ale seriously. We decided to try the taps, firstly having a 6.5% German brewed Aecht Schlenkerla "Rauchbier Urbock", a lovely brew with sweet caramel leading you to a nice smokiness, almost like a Christmas ham!, and Browar Stu Mostow "WRCLW Pils", 5% which was a touch biscuity, with grapefruit coming through at the back, making it more an IPA, I thought. Second up were a lovely heavily fruited Brown Porter (although it poured very clouded off-white) called "Lost Berry" from Maryensztadt 5.2%. We also tried "Jack Strong", a 7.6% Imperial IPA from the same brewer, which had a big bold malt flavour, some herbal traits and a rich sweetness. The finish is increasingly dry and makes it quite moreish. Next up was The Brothers Bar, a much quieter place just 5 minutes walk away. There was a reasonable selection of keg beers in here, but not much in the Craft line so I opted for a Czech brewed Zubr "Schwarz" a 4.1% Dunkel, which was bitter-sweet with a delicate, almost floral hoppy finish. Jane had a small shot of the local Soplica hazlenut liqueur, which, by the smile on her face, went down very well. Draft Board Game Pub was the next bar of the evening. This is a quirky place, Craft Ales at the bar and an area downstairs for games devotees. Serious stuff if you play. We ordered our drinks and then popped downstairs, out of curiosity, and were amazed at how focused these players were. The games are all free and some are still being developed there before going on to be enjoyed in the outside world. Apparently we were rubbing shoulders with World Champions in a Star Wars game. Our host, who was there to show interested parties how to play, was excellent company and took the time to just chill and discuss Polish life, history and an insight into the following day's Independence and St Martin's celebrations. What a nice guy. Browar Za Miastem "Wlasne Sprawy American Pale Ale", 5.6% was my selection from the bar, which I found solid enough, some nice sweet malt then hints of sour bitterness at the back. "Tyskie Gronie" was Jane's favoured tipple. By now we were getting peckish. We decided to head back to Stary Rynek and were invited in to sample the delights of Rynek 95 Restauracja. Goose, all the trimmings was offered, at a price one could not refuse, so we were soon sat downstairs, in the catacombs, almost, waiting for our meal.To go with the food Jane had a "house" beer, by this time my memory chips had started to go on the blink, so I can't quite recall which Polish lager it was. I, of course, could remember, through my memo app and photo evidence, my choice. Paulaner "Hefe-Weissbier", a Dunkel which imparted nice sweet malty flavours with fruit and bready yeast coming through. 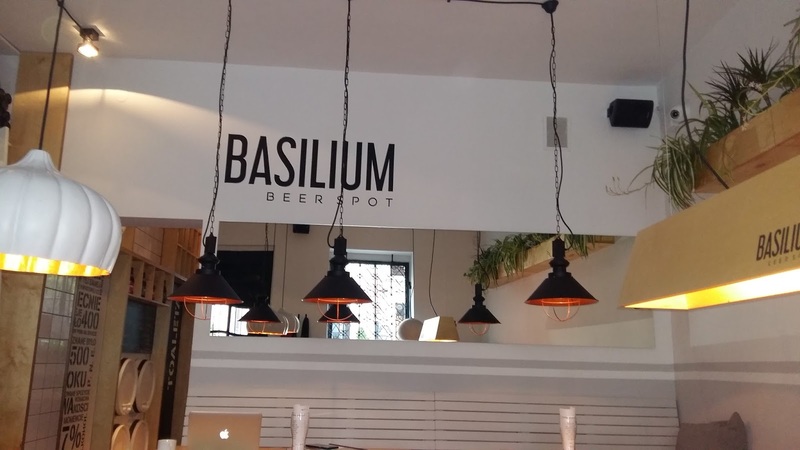 Basilium, Great bar, good beer. ambiance very relaxing. In here, after suggesting our preferences, we were served with our beers, and went to sit with the locals. Waszczukowe "Lycha Zbycha Whiskey Stout", 6.9%, a beer with a smokey peat vein running through with slight coffee and light chocolate at the back, was my first beer, which was followed up by another from Waszczukowe, "Ruda Maruda". This Red AIPA, 6.2%, has a balanced caramel opening as bready notes and some citrus gradually ease through. The finish has slight tropical fruitiness, a reasonable hoppy bitterness with just an edge sourness. We could have stayed here longer, enjoying good beer and friendly conversation but it was Polish Independence Day the following day and Saint Martin's ( swiety Marcin) Day in Poznan in particular, which would feature a colourful parade, street food and, of course, the locally produced and certificated croissants, or "rogale" which are eaten in great numbers, and we would like to experience it. We awoke quite early and I immediately set about prising my tongue off the roof of my mouth before having a couple of cups of coffee, slowly nearing a state of readiness for the day. We eventually left the hotel, jumped on the tram and headed off to the aptly named Saint Martin's Street. The weather by this time was awful, but the street food was interesting, tasty and very traditional, and the parade was well worth catching. Colour, firecrackers, smoke and a glimpse of history mixed with the aromas of the food stalls made for a quite a spectacle. We were glad we joined the throngs of locals on their big day of celebrations . Still slightly hungover from yesterday's imbibing, and now rather cold and damp as well, we decided on a quick drink and then back to the hotel. Our hostelry of choice was to be one of the two Ministerstwo Browaru bars. This one is just off St Martin's Street. The place was very busy, and only had one member of staff on at the time of our visit. I went for a local "dark" ale whilst Jane chose a lager styled beer. Because of the lively and hectic nature in this crowded bar, caused by the day's poignancy, observance, merrymaking and jollification, I failed to note with which beers we were supplied, but needless to say, both were excellent. We would have stayed for more but being cold, wet and still quite weary after last night's excesses, we decided to head back to the hotel. Once ensconced in our room, Jane settled down to watch a Polish film with Polish subtitles about the post war independence, whilst I settled down to write up my beer and pub notes whist enjoying a glass of Soplica, and one of my shop bought beers. Our last day in Poznan, for this trip, was now here. We went down and enjoyed another hearty and varied breakfast in the hotel. We decided another walk into town and a visit to Stary Rynek would set us up for the journey home. The weather was bright, sunny but cold and pleasantly bracing, which added a little haste to our meander. We were soon back in the centre, ready to bid farewell to the familiar facades we had become very acquainted with during our stay. We wandered round, took some more photos, bought a few goat related souvenirs and then went for a drink. This time we chose to try Motownia Premium Bar and Pub. We were, again, warmly welcomed into the large and friendly bar and soon decided on our drinks. Jane went for "Grzaniec Galicyjski" (the local mulled wine) whilst I went for Fortuna "Komes Baltic Porter", 9%. 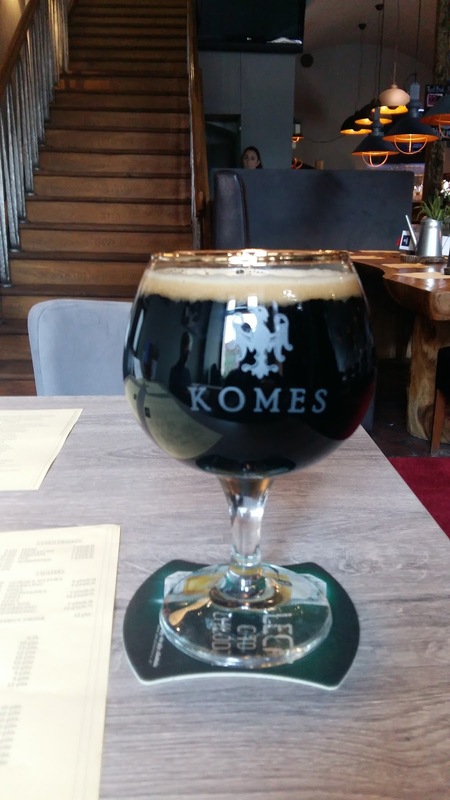 The "Komes" has a really big dark chocolate backbone with a fair lacing of liquorice and some dark fruit. There is a slight sourness which helps raise it further.The finish is dry and the high ABV is well hidden. This was followed up by a Fortuna "Mirabelle" (Plum) beer, 5.1%. Another enjoyable brew from this brewery which was full of fruity flavour. A sweet, almost jammy, plum taste sits proudly on top of a good malty opening, alongside a mild tartness. What a nice, satisfying fruit beer. Time was ticking, so we decided on a last visit to Basilium before heading back to our hotel to pick up our bags. On entering we were remembered and greeted as regulars. The barman recalled my tastes, and which beers I had experienced last time. I was offered a local dark beer I had not had before, Browar Waszczukowe "Grazyna Sprezyna Toffee Stout", 4.5%. a beer which has a reasonably sweet malt opening, with that toffee pushing through. Some chocolate is evident, as is vanilla. Jane opted for a locally brewed cider which she assured me was very good, if a little sweet. My last one in here was Kingpin "Fake Lancelot", a Saison of 6.3%. Peach and sweet caramel at the start give way to more fruitiness, some fresh grass and a good bitter and dry finish. A nice way to round off our final afternoon in Poznan's beautiful and historic centre. We headed back to pick up our bags from our hotel, and await our taxi back to the airport. I decided on a bottle from the hotel bar whilst we waited. "Latarnik Rewalski", a Wheat beer of 4.8% from Minibrowar Kowal. Slightly darker than some wheat beers, but certainly not in the dunkel envelope, there was some lovely fruit flavours going on in the glass, orange, slight peach were especially noticeable, with just a modest coriander hint at the back. This was to be the last Polish craft ale we were to sample whilst in Poland, although we did pick up some at the airport's duty free counter to sample back in the UK. As we sat in the airport departure lounge, grabbing a quick 5.6% Zywiec Premium we were pleased we had decided to try the Polish hospitality and experience all those great beers and friendly , embracing pubs along with the good hearty meals. We will be back again to try a few more, no doubts about that. The "extra bottles, and Duty Free. On Wednesday's alternative route-marched return to Hotel Vivaldi, I mentioned we came across a Craft Ale shop, one of the various Duzy Ben stores which are dotted about the city. Well, it would have been daft not to pop in! We picked up 5 different beers in here to sample back in our room. The selection of local, national and international beers and ciders within was very good, as was the medley of wines, liqueurs and spirits. Fortuna "Miloslaw", one of the beers already reviewed, was among the quintet of beers. The others were, Zywiec Group/Heineken "Warka Strong", a sweet malty Strong Pale Lager, 6.5%, with a slight metallic edge, some nuttiness comes through in the sweet roast malt finish. Not bad, to be fair. "Puola/Polska Finish Export Stout", 8.8%, a collaboration brew from Browar Wasosz (Poland) and Humalove (Finland) is a stout brewed with Lingonberries which was dark, rich and has a good punch of bitter fruit and the warmth of fortified wine coming through. Some coffee enters the fray towards the long dry and mildly bitter finish. Very nice. Browar Jana "Porter Baltycki", 8.8% was another excellent offering. There is a lovely cherry fruitiness at the outset of this one, which combines well with dark chocolate and just a hint of roast malt. These flavours carry on to the finish which is medium dry. Doctor Brew "Yellow Bourbon Dark Lager, with coffee milk", 4.9%, was an earthy tasting beer, some vegetable traits and the mildest tang of coffee. Not to my liking, I'm afraid, but hey ho! First was their 9.8% "Porter", a brew which has a bready, biscuity taste at the back of a choco-coffee opening gambit. Some roast malt and nutty hints and very well hidden alcohol strength. "Mastne" is a 5.8% "Traditional Ale" and also comes under the guise of "Brackie Mastne" Caramel sweetness is the first sensation to hit the tongue, then a medium bitterness before a drying medium finish. "Double IPA", 8%, had tropical fruit over caramel at the start with some grassy highlights. A slight spice warmth appears on the palate and then leads you to a mildly bitter-sweet finish. Marvelous. Last up was their 6.2% "Stout". Just a touch thin and watery, I thought, but there are nice rounded spikes of spiciness and chocolate, caramel and a hint of nuttiness. The finish is dry with a touch of sour tartness. All in all I found these beers not too shabby at all. They were all worth tasting, and quite varied. Until the next time, Cheers, and keep it "Real"
Jane and I have been really fortunate to enjoy two Mediterranean breaks this year, both times we found ourselves returning to previous haunts. Firstly, in June, we visited Malta and Gozo, following up with a September excursion to Cyprus, which took in the Paphos area as well as an overnight stay in The Turkish Republic of Northern Cyprus. As was expected, the weather was fabulous in our chosen locales during our visits which was very encouraging for us to move in the direction of liquid refreshment. So, out and about, what did we discover on our re-visits to these wonderfully picturesque and very hospitable Island nations lapped by the Blue Azure sea.Well, let's find out. After spending a week on Honeymoon here last year, and enjoying a few of the beers ( Reviewed Here ) we decided to return for a fortnight this year, and soak up a bit more of what the islands had to offer. I was especially on the lookout, as always, for a few different beers and ales, and craft ale bars, which my research had showed me existed across the Islands. We arrived late evening at our resort, so had a low key first night. Staying in Mellieha again , we sank a couple of Farson's Hop Leaf beers and Cisk Lagers locally, before turning in. Tomorrow I would have my "beer radar" tuned in and turned on and the search for new beers to review would start in earnest. A trip to the supermarket the following day threw up the usual Farson's offerings, but I did manage to get my hands on a trio of this brewers' beers that I had managed to miss out on last year. First up was Farson's "Double Red". This 6.8% Premium Strong Ale has a big, bold sweet malt body but is well balanced with a back hop bitterness. The hop bitterness carries on to the finish and helps create a rather palatable brew, especially in the hot sunshine. The second brew was Farson's India Pale Ale 5.7% This is a light, quite floral IPA with just a hint of hoppy bitterness at the back. There is some well balanced malt sweetness within the body, and I found it a very enjoyable beer. At 9%, Cisk Strong was the last of the three I sampled, which puts my tastings of this brewer's wares up to a round dozen. Strong is quite sweet, but not cloying, and there is a dark fruit lacing to the opening. The high ABV is quite well disguised and the finish has a sort of sherry barrel infused warmth. I was surprised at how drinkable this one was, especially after some "cheap" beers I have suffered at these inflated strengths. Speaking of which, may I introduce to you Cody's. These beers are brewed by Oettinger Bier Gruppe, Germany and the two I purchased from the local supermarket were very cheap. Cody's Extra Super Strong, 12%, was very sweet, sickly, and every percent of alcohol within was evident. Spicy on the back of the palate, but not in a nice way, which leads to an unbalanced alcohol burnt finish at the back of the throat. This was not a good brew. The "lighter" 8.9% Super Strong was a touch more palatable, but was still too sweet, cloyingly so, and still imparted an awful alcohol burn as it went down. I felt these were beers made for a certain market, those who wanted to reach a certain state of stupor as quickly as possible for whatever reason. I wouldn't have them again. They were certainly not to MY liking, but each to their own. Other bargain bucket beers we encountered included a refreshing but rather thin and watery lager, imported from Poland's Van Pur SA, by the name of Barley Classic. At 4% it merely acted like flavoured water in the heat, and as cheap as 50 cents in some places, I could see why it sold. We also encountered the EU brewed (no specific location but for Malta's Cassa Camilleri), 1565 Victory Lager. This, brew at 4.5%, was another no frills, average Euro-beer, which was slightly sweet, medium grass notes at the back with an OK, medium finish. We also discovered, in the Spinola Bay Labour Party bar, cans of Zagorka Special Lager.This, too, was a run of the mill beer. Imported from Bulgaria, it slaked a thirst, but very little else. You must be wondering by now if, besides some of the Farson's range, there are any half decent beers in this small archipelago. Well I can tell you that Craft Ales and Bars are available, especially if you do limited research beforehand. Lord Chambray, based in Gozo, Phoenix Raw Beer, produced in Naxxar, and Stretta, a Euro-brewed beer made from a Maltese recipe, are all in evidence if you look beyond the numerous tourist bars, and in Sliema there is a micro-brewery and pub, The Brew, which is now producing its own beers. So, are any of them any good? I'll begin with the Lord Chambray beers, or rather the ones I didn't get round to sampling last time. Quite a nice brew, with a good dry bitterness throughout. The finish has a reasonable citrus twang to it. I would say this is nearer a Pale Ale in style than a Bitter. An enjoyable beer. Another refreshing brew, with medium malt and hop notes. To be honest, I found this one just a touch on the plain side. Pleasant, but just lacking in interest. I really liked this one, my favourite from the Lord Chambray Brewery. Full flavoured, with dark fruit and a medium sweet malt combination at the outset. The spice kicks in next, with cinnamon and nutmeg springing out to announce themselves. The finish is smooth and packed with fruity flavours and a good bitterness that creeps in. A very good winter ale, drank in near 30 Celsius. That concludes this brewery's beers, with the exception of Flinder's Rose, which is a seasonal brew which wasn't available when we were there. All in all, they are not too bad at all. They are available at quite a few bars, restaurants and the bigger supermarkets. They are not the cheapest of beers, but they are worth a try if you come across them. The other Maltese Craft Ales I have included below. A confusing bloodline precedes this beer, crafted from a Maltese recipe. The bottle label states "Brewed & Bottled: Brouuwerij Troost Westergas, ....Amsterdam" but on line sources state the brewer as Opperbacco, an Italian micro-brewer. Whoever brewed this IPA, they certainly did a good job of it. Smooth malt at the outset with floral notes coming through, just a hint of oranges is detectable at the back. There is a wave of tropical fruits, some yeast esters, then a long, crisp citrus edge that works its way to the bitter and dry long finish. Very nice. We still have the new Stretta Muzajk Atlantic Pale Ale to sample the next time we visit. A collection of 4 beers, brewed in Naxxar. These bottle conditioned ales are reasonably easy to find, mostly in the craft bars around the island. Here are my reviews of the range. Quite effervescent on uncapping. First taste is sweet malt. There are veins of honey, yeast esters and soft fruit also in the opening mouthful. This then leads to a more balanced bitter-sweet finish with a touch of grassiness right towards the end. Not bad, just a tad too sweet for my palate at the start. An English style Bitter with good malt and a hint spice tones and the start. Hoppy and dry at the finish with a hint of citrus bitterness. Quite well balanced. Rich roast malt opening with toffee and caramel enveloping the taste-buds. Dark fruits linger and spice combines with citrus notes towards the reasonably long finish, which is crisp and very dry. The first thing noticeable is the carbonation, but after the opening gush, chocolate, coffee and cinder toffee creeps out. It is quite well balanced and eventually yields some dark fruit at the back. A good bitter dryness is at the finish. All taken into consideration, these are not too bad. Are they World award winning ales? I doubt it, but they are not bad beers at all. They are an enjoyable distraction from the usual and I would not hesitate to have another of any of the range. I do think the fizz needs sorting out a bit though, which is going to be hard to control in these temperatures, I would imagine. The Brew Bar and Grill. A micro-brewery and bar producing its own beers on the waterfront in Sliema. On our couple of visits, it had 5 of its 6 beers on tap. The missing beer during our stay was Vienna a 5% Pale Ale. This is a nicely hop bittered beer, with just a hint of tartness to add interest. Long bitter and dry at the end with a touch of yeast esters towards the final fling. Very refreshing. Sweet, but not cloying, with a nice caramel taste before the floral honey notes arrive. The finish is nice, bitter and long. Quite nice, if you are a fan of honey beers. Chocolate and dark fruits are the backbone of this one. After the well balanced opening sweetness comes a good bitterness, which is carried on to the end and leaves a tart aftertaste. Simple opening, complex finish. Nice one. A fruity and quite creamy ale. Berries at the back and nice yeast esters at the finish. Very refreshing. Now, if you were expecting a "Crabbies" style ginger beer, forget it. This is a good malty beer with a nice rounded pale ale styled taste, but with a subtle ginger infusion. It is extremely well balanced and the infusion of ginger at the back really works well. The Hole in the Wall, which also gets good reviews for its ales. 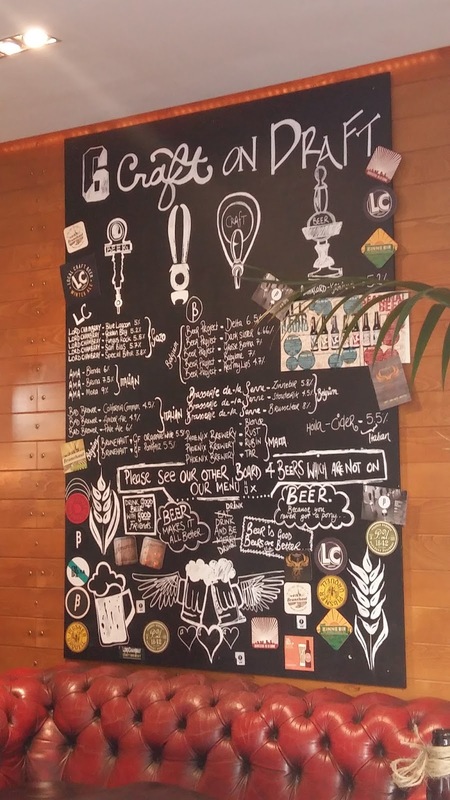 Across in Valletta, the Craft Ale scene is also beginning to take off. We had a couple of day trips here and enjoyed the hospitality of two really good bars. First, La Bottega, in Merchants Street. This is a small coffee shop styled bar. On entering, the array of beers available soon manifests themselves to you from the shelves. The staff are very friendly and have a good knowledge. It is another place to watch the world pass by, accompanied by a good cold Craft Ale. The next bar on our list of the Capital was 67 Kapitali. Now this is a must-visit place for beer drinkers. Owned by English ex-pats Lena and Dom, this bar, in Bakery Street, has a wonderful vibe. it is also the only place we saw Craft beers on tap, and an excellent selection of beers from all over the world. Lena and Dom are really serious about beer, and never shy from answering any questions about the cafe-bar's wares.The rest of the staff we met were also enthusiastic about their beers and ales too. A truly excellent way to unwind in Valletta. There are a few other bars in the city offering Craft Ales, StrEat Whisky Bar and Bistro and Gugar Hangout Bar are two of the others nearby although we didn't have chance to visit them. St Julian's Band Club, Spinola Bay, is a good bar to drop into in St Julian's. Along with the usual Farson's selections, one will find a fridge of Craft Ales too. This being a local band club, the prices are cheaper than many of the surrounding hostelries, although Tony's Bar, just across the way from here, also offers a limited number of Craft Ales at a reasonable price. All taken in to account, this was another enjoyable break in Malta and Gozo, a place we hope to return to again in the future. Cyprus. Both sides of the Green Line. The last time we were in Cyprus (Here) we stayed in the centre of Paphos and were lucky enough to be shown around by good friends of ours, taking in, among other highlights, the great Aphrodite's Rock Micro-Brewery and Brewpub based in nearby Tsada, which produces some very good Real Ales on the Island, not to mention fantastic meals. This time we wanted to see what other beery offerings were out there. During our previous visits, we had always enjoyed the two best selling Cypriot brewed beers, Keo and Leon, and this time they again tasted just as good in the heat of The Med. We were based just south of Paphos airport in the village of Mandria, at the home of our friends with a very loose schedule, apart from an overnight stay over the "Green Line" in The Turkish Republic of Northern Cyprus later in the week. Arriving late on Sunday evening meant our first foray out was not until Monday afternoon. We were offered the use of the car, after chauffeuring Geordie, one of our hosts, to the beautiful Aphrodite's Hills Golf Club for a round. Golf isn't our "gig", so this type of round was not for us, so after a little while, we were again on the B6 road, heading towards the British Sovereign Base Area of Cyprus around Episkopi, eventually stopping at The Bottle Shop, a lovely well stocked off licence on the outskirts of Ypsonas, near Kolossi. I had heard of a brewery around here, True Ale, run by a Russian family, which was producing four bottled craft beers, so this shop offered a good starting point to find them. Unfortunately, I was informed by the shop proprietor of some "exploding" bottle issues with their wares so these, we were told, had been recalled. That meant we had drawn a blank on them on this occasion. More of that to come. Whilst we were here I decided to grab a couple of beers anyway, it would be daft not to, and eventually I decided to pick, amongst the ample bottled stock, two beers from Belgium. We sampled these later, back at base camp, although Jane, who had chosen her favourite Cypriot tipple, ouzo, back at the shop, declined, preferring to enjoy that instead. First up was Floreffe Bierre d'abbaye Prima Melior, 8%, a beer with sweet caramel as its backbone, followed by liquorice and dark fruits lurking before a very long slightly bitter finish. Next, Waterloo Triple Blonde from Anthony Martin Brewery. This is a lovely fruity brew with some yeast esters at the back, with a floral kick coming through. The finish is very dry and moreish. A mixed start to my Craft Ale quest then. I would eventually track the True Ale beers a little closer to our holiday base, at The Wooden Pub 1 in Paphos a few days later. After the wait, and anticipation, I was reasonably pleased to actually have them in front of me. How did they fare? Well, not so good. Here are my reviews. A very thin tasting brew, slight hints of liquorice and a faint dark fruits lacing, but not much else. It is very lively, in fact too lively which is reflected in the dirty-looking pour. It is not a memorable beer at all. A touch of orange and soft fruits in the opening taste, bread and yeast esters then seep in. The flavours are too subtle and this, again, gives it a very thin taste on the palate. The finish is very short and leaves very little to get excited about. This one is easily summed up. It is better to be concise about these as one would struggle to expand further. This Pale is a bit fruity, a bit yeasty, a bit boring. Three down, one to go. Surely this one will bowl me over. This was served with a slice of orange, as suggested by the knowledgeable staff member who served me, which was a good idea. The beer had no taste at all, pre and post orange slice, but the orange slice was very nice and refreshing. I had been given fair warning by the bar staff that these were not the best beers on offer here, this is a Aphrodite's Rock Brewery pub after all, but if you don't try, you can't comment. I was also advised about the high price too. I have to agree that these beers have a long way to go before I would sample them again. They are too expensive, coming in at €5.90 a bottle, too weak in ABV and just lacking in any taste. Add to that the vesuvius style uncapping and you can see major improvements are needed. I hope these problems can be ironed out and, maybe, my next visit will yield a few positives for this brewery. 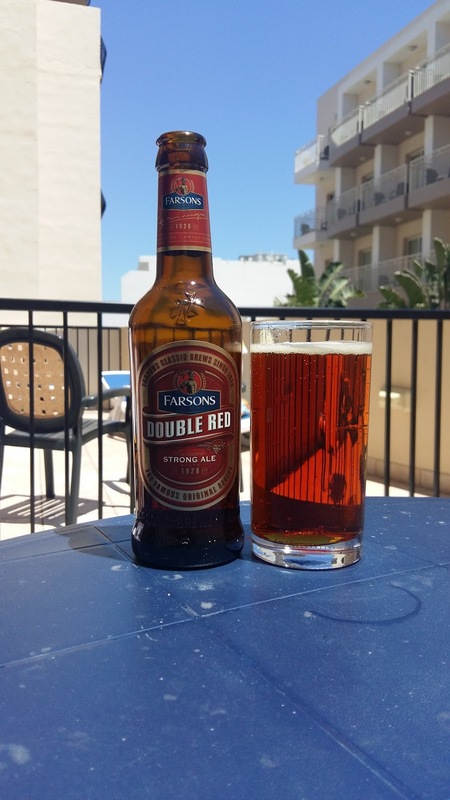 The outlets for Craft Ales in the Paphos area is a touch limited, although most supermarkets sell one or two British bottled beers. The beers in the bars are the usual suspects, although more are stocking the Aphrodite's Rock beers, which is good to see. Incidentally, Aphrodite's Rock have also opened a second outlet in the resort, The Wooden Pub 2, just standing back from the Tomb of the King's Road, which is very good to see. On our previous visit to Paphos, Everards' Beacon, brewed under licence on Cyprus, was on tap in a few bars but this trip we noticed that this seems to have been replaced by Wadworth's 6X. We assumed this is by similar agreement. There is, however, an excellent Beer and Cider shop, by the name of The Beer Sellar, on the edge of the main town, heading towards Geroskipou (Anthipolochagou Georgiou Savva 34, to be more accurate) This is owned by Athos, who also has The Old Fishing Shack Pub. Now, if you want to talk passionately about ale, beer and cider, surrounded by a massive selection of world beers, and stock up on a few bottles, this is the place to go. Athos will share his knowledge freely to like-minded connoisseurs of the brewers art and steer you in the right direction. 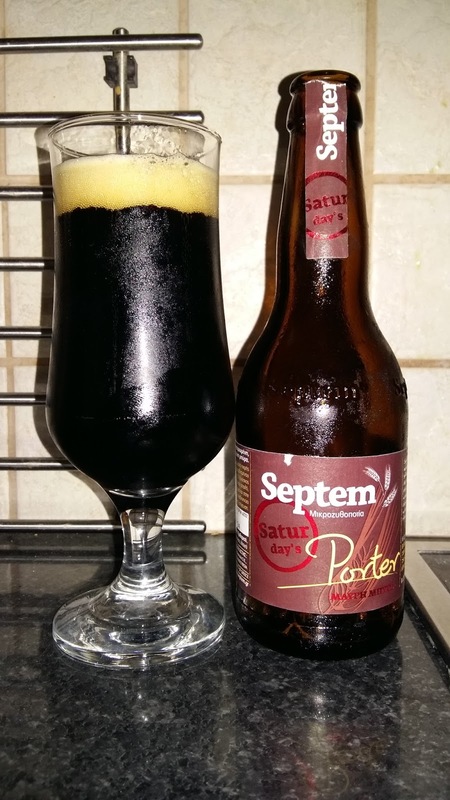 On our visit we managed to pick up a great selection of beers from the Greek Micro-brewer Septem. Each represents a days of the week. As we know, the eighth day was when the Big Man upstairs created beer. Here is my sampling notes. A nice well hopped Pilsner, with lovely grassy back-taste. There is a smooth fruitiness, a hint of citrus and a rounded bitterness at the finish. A very well balanced beer, and a very refreshing Pilsner. Bitter orange and sweet caramel are the opening gambit of this IPA. Citrus zest gently envelops the palate soon afterwards. The citrus zest then drives this beer to a dry and bitter finish. A really good IPA. A big malty brew with dark fruits and caramel combining to give this beer a real solid base. There is a tingle of spice evident which stimulates the taste-buds with gentle warmth. The finish is very long and dry. A really nice pale,with a smooth rather earthy taste. A touch of grass, some floral notes at the back and a lovely bittersweet finish that is incredibly well balanced. Roasted malt and slight burnt toffee hints are in the opening to this beer, which adds a nice backcloth to the ensuing coffee and slight chocolate flavours. Sitting at the back there lurks an almost red grape type richness that carries on into the long, warming and dry finish. One to savour. Septem Sunday's Honey Golden Beer. 6.5%. A rather sweet beer with caramel malt opening before a real whoosh of honey takes over. This then leads to a bitter-sweet and quite dry finish. I am not a big fan of honeyed beers but I did rather like this one. This brew opens with a good tropical fruit taste, some yeast esters are also present and give it a real depth of flavour. There is a lovely creaminess on the palate and this all eases through to a wonderful dry bitterness at the finish. This is a really solid brew and one I enjoyed greatly. Well, you will probably notice that Tuesday is missing. I don't know if it was there in the first place! Anyway, in its absence I chose this one. Lava taste quite like a Scotch Ale at the outset, with traits of rich dark fruits coming through turning it almost into a Christmas cake in a glass (without the lumps!). At the back the smooth rich flavour has a port wine kick to it. The high ABV is very well hidden and makes it very drinkable indeed. This is a good selection of beers from this Evia, Greece based Micro-brewery. They are packed with well balanced flavours and seem to cover most bases and styles. I would gladly give them all a second sampling next time around. Another couple of beers we picked up at The Beer Sellar were Marea Blonde, 4.5% from Elixi Brewery, which was filled with floral notes, some peach hints and yeast esters at the back, and a collaboration brew from the Newcastle and Caledonian Breweries. The collaboration beer, Caley Amber Ale, 6.5%, was quite a sweet tasting beer at the start, with the malt slowly ebbing to allow a hint of fruit and some citrus bitterness through. The finish is increasingly dry and quite long, making it a very interesting and quite complex ale. Whilst in Cyprus, we had planned a night, over the Green Line, in The Turkish Republic of Northern Cyprus. We had been across the border in the past, using the the Famagusta crossing and Ledra Street in Nicosia. This time we would be crossing at Kato Pyrgos, up towards Morphou Bay. We arrived via the picturesque road passing through Polis,and Pomis and were very much surprised to find only a single car waiting in front of us. The paperwork was swiftly dealt with and within 10 minutes we were through and admiring more stunning scenes as we drove up into the mountains, before gradually winding our way down towards the coast and our destination, Lapta. We booked into our hotel and then ordered a beer. I had heard of a brewery here, Lion's Heart, but this had subsequently closed, so our options on the beer front would be mainly from Anadolu Efes Brewery in Turkey. Whilst there we managed to sample the following beers. Malty at first, some grass tones and a reasonable, but short lived, bitter finish. Refreshing, but ordinary, lager. A welcome beer in the heat. A moderately sweet beer, some slight honey style traits, a hint of a metallic twang at the back, but overall another drinkable, but average, brew. Very sweet, quite metallic and unbalanced throughout. An acquired taste but not mine. Quite similar to Xtra but more sickly sweet than that. The metallic taste is still there, very distracting and making it more unbalanced. A beer to forget in a hurry although others may think otherwise. To be fair, not bad. A wave of caramel malt leads before a nice bitterness, and hints of citrus, leads you to a bittersweet and reasonably long finish. A clean and crisp lager taste with some grass, and slight citrus notes at the back. There are bread-like tones that come through and the finish is slightly sweet but dry. Not too bad at all. A sweet caramel opening with a touch of fruitiness before a balanced bitterness takes over. I thought this was a fairly decent beer. There are plenty of bars and restaurants in Northern Cyprus, Kyrenia, especially, is a bustling place full of watering holes. Craft Ales, though, are not so prevalent. On our visit, we didn't find a single establishment stocking any of these brews. That is not to say they are not available, but just quite hard to find. A nice place to visit, but not a beer tourism hot-spot. Malta, Gozo, Cyprus and the Turkish Republic of Northern Cyprus have quite a lot in common, beautiful beaches lapped by the azure sea, hot summer sunshine and that laid back Mediterranean way of life. There are differences when it comes to the beer drinking culture though. 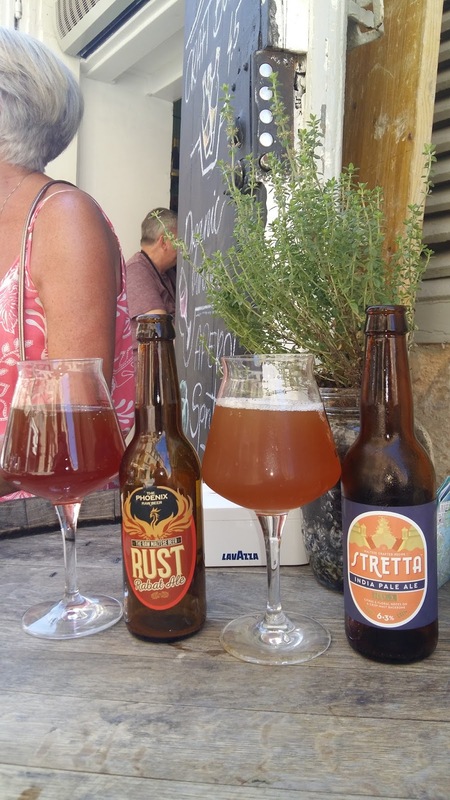 The Maltese Islands seem to have embraced the Craft Ale revolution, with Valletta seemingly leading the way with cafe bars being "The" places to chill. Most major villages and towns have at least one outlet for the local craft brews, which is quite promising. Cisk will still be top of the bill, but years of Farson's producing the other varied brews in their portfolio has given the "other" styles more of a chance of getting a foothold in the market. 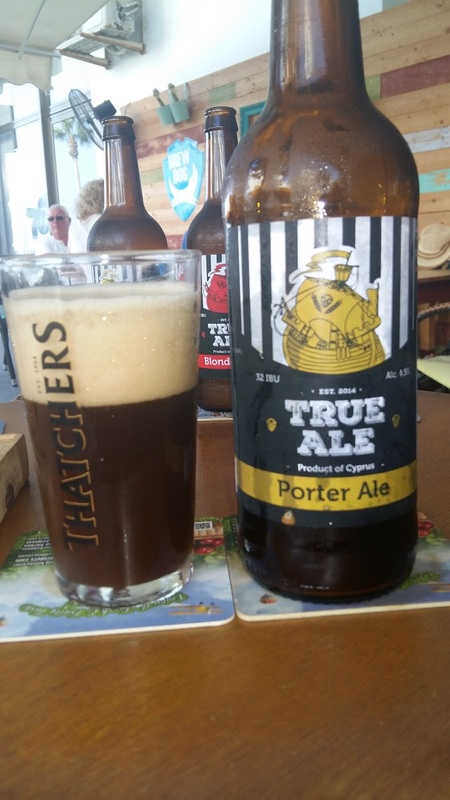 The Paphos area of Cyprus, on the other hand, is a place one has to do a little bit of leg-work and research to help you discover a few Craft ale bars, although the Real Ales from Aphrodite's Rock Brewery are getting more freely available, especially the bottle conditioned brews. It is usually quite rewarding when a new outlet for beers and ales is found here on your travels though. 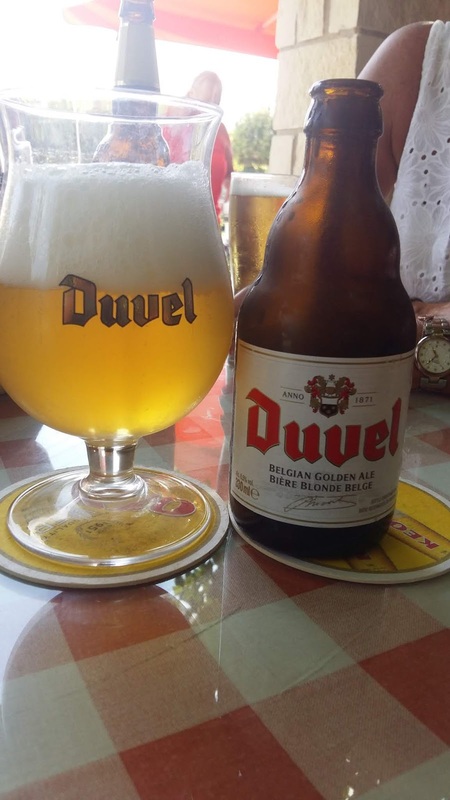 Keo and Leon, understandably, will still probably remain the top sellers across the whole of the south of the island for the time being, though, because, let's face it, it is very hard not to enjoy cold lager in that heat. Northern Cyprus,admitedly, certainly has a lot more to do, but I am sure, eventually, things will change. I must just mention at this juncture the bars of Mandria, and neighbouring Kouklia. For two small villages each boasts a good handful of eating and drinking venues. The competition in each location certainly helps boost portion sizes and keeps the beer prices down. Kouklia also boasts Fozzie's Bar, although we merely share a name, not any profit! Our next overseas trip will take us to a slightly cooler part of the Continent, Poznan, in Poland, which, we are reliably informed, has a lot to offer the beer tourist. We will soon find out. Cheers, and keep it "Real"
All Day And (nearly) All of The Knights in Lincoln. Just prior to Jane & I flying off on our Summer vacation to Malta, I had arranged a day out with a friend of ours, Steve, in Lincoln. 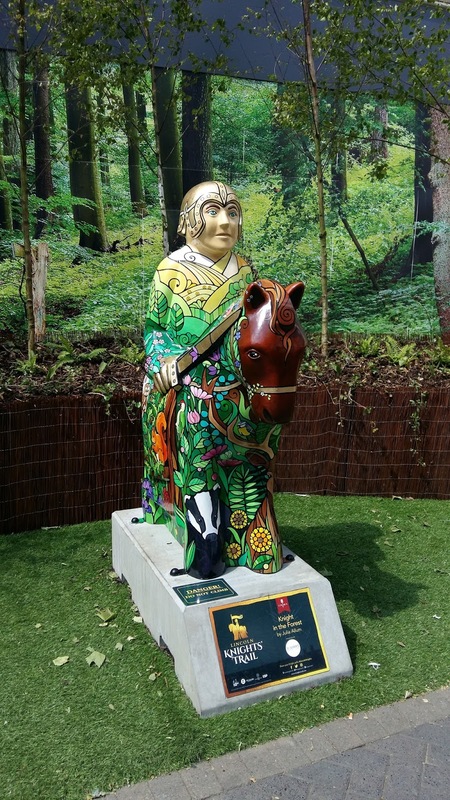 Now, although we only live an hour away from the County capital of Lincolnshire, we are not what you would call frequent visitors to this history steeped cathedral city. Steve had been there fleetingly, by car, on shopping trips, being dragged around as part of his partner's retail therapy. This was usually followed by hitting the nearest pub to the car park for a spot of lunch and a quick pint, then the drive home. He forlornly admitted to not being aware of the lay of the land when it came to the cask beer bars and craft ale establishments of the city. I, on the other hand, had been a couple of times over the last couple of years, my last trip as recently as December (Here). So, we set a date, found the times of the trains and arranged to meet up. Our chosen Friday morning duly arrived, and with newly acquired tickets in hand, not to mention 30 minutes to waste before departure, we re-adjourned to The Yarborough Hotel, purchased a couple of beers and waited. I chose a can of Sixpoint Brewing Co "Bengali", an IPA of 6.5% with slight tropical fruit tones coming through on the back of a wonderful bitterness, which leads to a good zesty grapefruit finish. Steve, meanwhile, plumped for the creamy, orange and coriander laced "Blue Moon", the 5.4% Belgian White Ale brewed by MillerCoors. 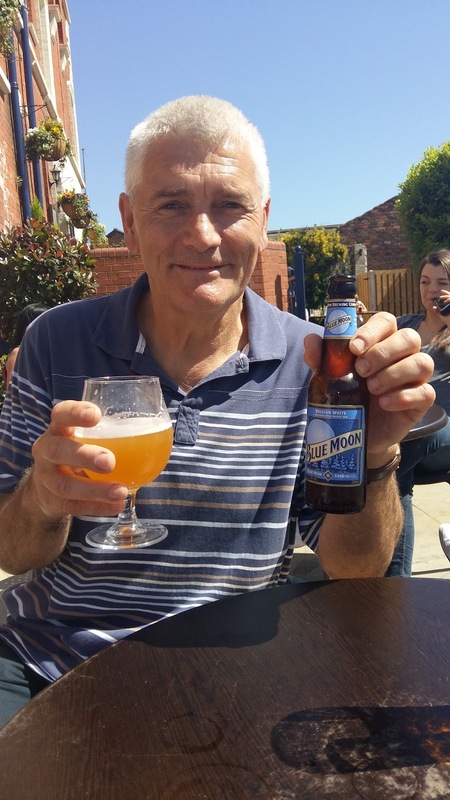 Whilst enjoying these beers in the hot May sunshine of North East Lincolnshire ( and, yes, it was hot!) I relayed to my drinking partner the recently acquired news that "It's the Lincoln CAMRA Beer Festival this weekend too!" "Oh, we're not going to get pissed and miss the train home, are we?" I assured him all would be well. A Beermonster has a homing instinct like a racing pigeon when it comes to relying on public transportation after several beers. Well I hoped I was correct in my assumption. I was also aware that there would also be the distraction of some Street art to contend with on our crawl. We finished off and headed back across the road to the station. Around 60 minutes later, just after midday, we alighted our train at our desired location. I took my unofficial Beer and Pub Guide stance next to my willing-to-learn hostelry tourist, advising ".....just one to start in the T.O.C. ", as we headed round the corner to The Treaty of Commerce. In here I sampled the B&T Shefford Brewing Co 3.8% "Plum Mild", which had a reasonable liquorice malt taste at the fore before the plum back tones hit the palate. The finish was dry and satisfying. Steve went for a favourite of his, Bateman's "Gold", 3.9%. Unfortunately, he had to wait a while for the barrel to be changed, and when his favoured beer did arrive, it wasn't, shall we say, on top form. It wasn't undrinkable, but just not at its best. Being outside now, it did not deter us from enjoying the lovely rays of sunshine allowing us to bask in the pub's beer garden. After these, we partly retraced our footsteps back, before heading up the High Street, (passing many a Knight on the way, as part of Lincoln's A Knight's Trail, celebrating 800 years since The Battle of Lincoln. I think we encountered a fair few of the 30 odd statues on our meandering) and onto The Strait to the next pub on our agenda, the well stocked Cardinal's Hat. "Lilith's Lust" a Bitter of 4.1% from Horncastle Ales was Steve's choice, which had a good malty body with a slightly spicy bitterness, and was as traditional as any bitter should be. I went for Brass Castle "Hazelnut Mild". This 4.2% brew had coffee, slight chocolate and moderately sweet toffee hints at the outset before the nuttiness steers you to a bitter-sweet finish. I enjoyed this one, but the sweetness would become a bit cloying if drank as a session ale. After taking on these brews as sustenance, we were ready to face Steep Hill in one controlled, exhausting push. A couple of landmarks, more Knights and places of interest were intimated to, briefly, with gasps of breath taken in between, but on the whole it was a pretty silent transit up the slope. Our next stop was the Samuel Smith's managed Widow Cullen's Well. This lovely pub, in the Cathedral Quarter is as cheap as chips, friendly and in keeping with its historic surroundings. It also boasts its own well underneath it, which can (almost) be seen through a perspex viewing hatch on the way to the toilets. There was just the one cask ale on, Samuel Smith's "Old Brewery Bitter", the only cask beer brewed by this brewery now, and there was no guest cask beers, as is the norm, although the keg range was quite ample. Oh, well (no pun intended), we would have to have a pint each of that, then. To be fair it is quite a reasonable beer to sample, with slight biscuit and hints of fruit helping to lift this 4% ale to a reasonable bitter and moderately dry finish. Next up on the tour, after finishing our reviving pints of OBB, and situated just round the corner from our previous hostelry, was the recently opened Cask-Restaurant and Brewhouse, in Drury Lane. This alehouse is in the footprints of both the Cathedral and Lincoln Castle, with great views of the latter's formidable walls. There were half a dozen cask ales on offer, all local, as well as a brew plant situated inside the pub. 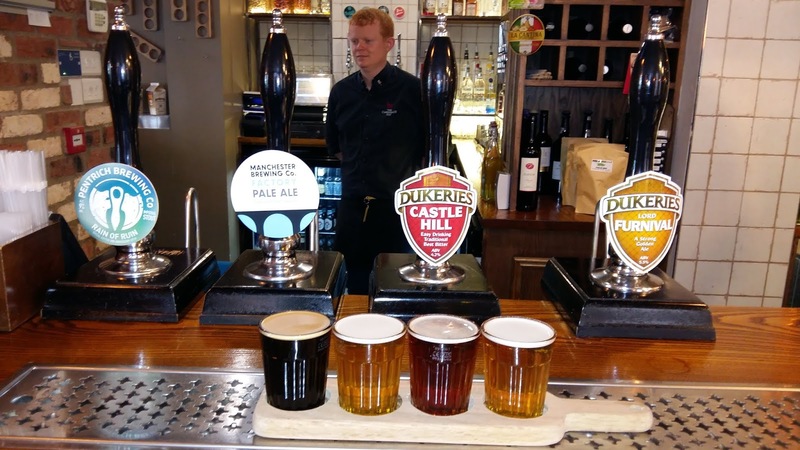 On our visit we were informed that the pub's very own beers would be available in a few weeks, so we settled for pints of Dukeries Pale Ale, 4%, and 8 Sail Brewery's 4.7% "A Knight's Ale". Both had fruity undertones and citrus at the back, but "A Knight's Ale", my chosen brew, had a satisfying malt vein running through to the finish, which was quite long. It had now been over 4 hours since my drinking partner had eaten, so, solids had to be sought out. Curtis, the Butcher was our next port of call, (having passed another Knight, or two en-route ), as it was the nearest grub outlet to where we had left, in the direction of our next pub, The Strugglers Inn. Steve eagerly awaited his Big baguette, filled with chicken, salad and whatever else could be crammed in, whilst I was perfectly happy, if I had to graze, with a Lincolnshire sausage roll. "Is that it? !, ...A sausage roll?....Just one?......Nah! I couldn't do that.......Just A sausage roll??!" went the conversation as we made our way round to the other side of Lincoln Castle, finally coming to rest at The Strugglers. My last visit here, in December, was marred by an alcohol induced self inflicted dose of amnesia, so, it would be nice to see the place again to discover what I missed last time, even with only one sausage roll on board. Steve went for a pint of 4.6% "Minerva" from Milton Brewery, which is a Golden Ale which after initial fruit and caramel, had a big hoppy punch, and refreshing bitterness. I had a half of Newby Wyke "Nagato", 6%, which was dry and fruity at the outset and followed by a big as a beach-ball grapefruit finish. Wow! This was a good beer. "Only half, is it? ", Steve enquired, followed by "I couldn't do that"
" Well, Yes. To be fair,.." I replied, "... sometimes less IS more, somehow, especially with some of these bigger flavoured brews. You don't get bogged down with all those flavours and subtle undertones which are going on if you savour them,and don't just sup them......equally important if you have only had one sausage roll!!" After more beer garden tanning, we left to reconvene at The Victoria, barely two minutes walk away. Now back in the pint envelope, it was to be Bateman's "Mr George" Golden Ale for me, and a pint of Timothy Taylor's "Landlord" for Steve. "Mr George", 4.4%, is a light, slightly fruity beer with a pleasant, quite floral hopped finish, which is extremely refreshing. It was most welcome on this warm afternoon as we, again, chose to sit outside and bake a little more in the sun. 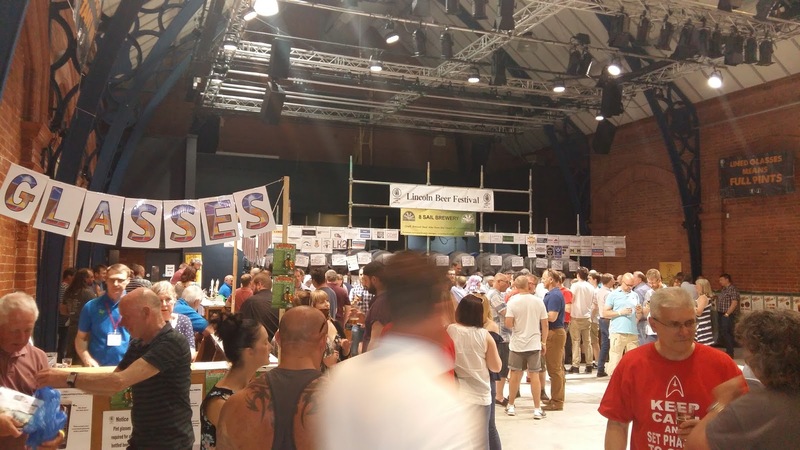 Our minds, or rather my guided tour itinerary, started to turn towards the Beer Festival, taking place in Lincoln's Drill Hall. The plan was to head off there next, but on retracing some of our footsteps, coinciding with a visit to The Crafty Bottle beer shop, I needed to stock up on some beers at home, We, complete with a carrier bag containing half a dozen "home" beers, entered the Strait and Narrow for one more before the Festival. I like the modern and cosmopolitan feel in here, and the range of beers, cask, craft and bespoke International lagers is quite impressive, as is the spirits and liqueurs line-up. Steve once again went for Timothy Taylor's, but I could not pass up a Bude Kreft Beer "Draco Raspberry Milk Stout", 4.5%.. Chocolate, toffee and raspberry, of course, are in the main of this smooth stout. The flavours combine extremely well and are well balanced. The finish is moderately sweet at the front with a dry bitterness gradually taking over. Very enjoyable. Great turnout at a good location. Axholme "Dockers Mild" 3.5%.- described in the Festival notes as "A classic dark mild." Castle Rock "Hemlock Bitter" 4% -" Full flavoured with fruity notes on the palate, hop ending." Chadwick's "Castle Mill Mild" 3.6% -"Black full bodied dark mild, smooth rounded, with a liquorice aftertaste"
Ferry Ales "Smokey Joe Porter" 4.9% -" Classic style Porter with slight smokiness"
Lincoln Green "Big Ben" 6% - "Dark mild with hints of toffee & treacle. Sweet finish"
Marble "Pint" 3.9% -"Dry session bitter with notes of citrus & grapefruit"
Peerless "Triple Blonde" 3.8% -"Blonde beer with fruity, citrus finish"
We finished off, and decided to make tracks for the station. "Just one more on the way back?" I suggested. It was agreed we would pop in the Jolly Brewer. "Where is it?" enquired Steve, as we came out of the Drill Hall. "There" I said, pointing at the green painted facade of the pub directly opposite.What a good place to have another pub! 2 minutes later, we were entering the pub which, surprise, surprise, was also holding its own Beer Festival! Talk about lucky, eh. The Jolly Brewer had the its usual offerings on the bar inside, and a dozen festival ales in the beer garden to the rear, not to mention a good line up of real ciders. This being a sort of celebration to Lincoln, its pubs and local Ales, we decided to raise a glass to a fantastic day out with a pint each of Lincolnshire Brewing Company "Festival Beer", 3.7%. Brewed for The Jolly Brewer Festival. All I can say is this beer reflected our day. Easy going, pleasing and good for a session. Next post on The Beermonsters Blog will be a surprising return to Malta and Gozo. A "Lidl" light refreshment. Budget Beers or Bodged Brews? Leeds. The Crawl goes on. Part Two. Hull of a Day Out, and Other Jottings. Lubricating the Wheels of Steel. The Sheffield crawl. My Norfolk Broads Boating Guide.